A bank examiner gone astray, Andrea Nguyen is living out her childhood dream of being an award-winning writer, editor, teacher, and consultant. Her impactful books—Into the Vietnamese Kitchen, Asian Dumplings, Asian Tofu, The Banh Mi Handbook, and The Pho Cookbook—have been recognized by the James Beard Foundation, International Association of Culinary Professionals, and National Public Radio for their excellence. She edited Unforgettable, a biography cookbook about culinary icon Paula Wolfert. Andrea has contributed to many publications, including the Washington Post, Wall Street Journal, Lucky Peach, Saveur, and Cooking Light. "Nguyen cleverly incorporates techniques and ingredients from other parts of the world into her Vietnamese recipes to make it possible for someone almost anywhere to shop and cook on any old weeknight." "Nguyen’s newest is as utilitarian as it is innovative." "With the same clarity and care displayed in her previous books, Nguyen guides even the nervous first-time pho navigator to slurp-worthy success." "Nguyen's recipes are a cook's dream...This is not unique to The Pho Cookbook; cooking from any of Nguyen's books is like listening to an incredibly patient friend explain a recipe over the telephone." 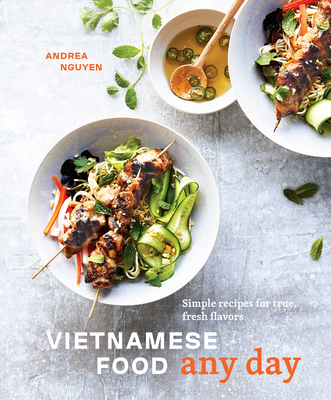 "Nguyen is a master teacher when it comes Vietnam's national dish, and in her new book she provides meticulously clear instructions for every imaginable variety--we recommend you cook through every chapter." "Nguyen is teaching a master class that ninth-graders can comprehend....[she] is respectfulof our time without diminishing quality."